It is becoming more common for people to ask me what they need to download to protect there machine from viruses and spyware. The following is generic advice for most Windows users trying to protect there PC for free. First let’s protect ourselves against viruses. I will now let you in to a secret, I would like to say that I am fully protected but I don’t run antivirus software on my development and media machines for technical reasons. Despite this I do recommend that you install a virus scanner on your machine under most circumstances. I advice you not to use Norton Antivirus that is often preinstalled on new PCs and available through Google Pack. It is not a bad virus scanner, it has had many great reviews, it may well run well on higher spec machines, but it has significantly slowed down all the machines I have run it on. Many say you get what you pay for when it comes to virus scanners, but while acknowledging the argument I believe a free scanner will be more than adequate for generic use. The best known free virus scanner is Grisoft’s AVG. This is free for personal use, works well and does not noticeably slow the machine. A newcomer to the free antivirus offerings is Active Virus Shield. This is interesting as it has been created by Kaspersky Labs and is begin supplied by AOL, although you do not have to be an AOL user. I am currently evaluating Active Virus Shield and not going to compare these two virus scanners, but I will note that Active Virus Shield can be used legally on some networked machines that AVG can not. Update: Active Virus Shield is no longer available for free from AOL but has been replaced with the equivalent McAfee Security Centre. If you don’t have a virus scanner installed and want to quickly scan your computer I suggest checking out Trend Housecall. Although not a complete solution this will allow you to do a system scan from your browser. Next you should consider using some antispyware software as having antivirus software running will not protect you against most spyware. I don’t claim to be up to date with all offerings, but I personally use both Spybot Search & Destroy 1.4 and SpywareBlaster 3.5 to both search for spyware and protect against it invading my machine. Finally you should consider a software firewall. Windows XP SP2 has a firewall built in, but this is very basic and I have found spyware that has bypassed it. The free offerings available are the basic Zone Alarm and the more advanced Kerio (free version activated after 30 day trial of full version). I use Kerio but the more basic Zone Alarm may be a better option if you want to keep things simple. Update: I have also been playing with the free Comodo Personal Firewall and it is fully featured and works well. Please remember that all this software will not completely protect you from everything and not opening unexpected emails or running untrusted software is recommended. 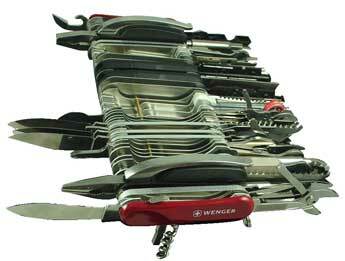 Wenger has released the 85 tools, $1,200 (USD) Giant Knife Version 1.0. This humongous Swiss Army knife weighs in 1.2 kilos and measuring over 22cm. more information and images are available on the Outdoor Life website. I dare say that this picture of a poster will be circulation the blogosphere for some time, but I thought I would help it on it’s way. I have seen billboards used for job applications before, but never divorce notifications. Death or Glory! Preferably Glory! 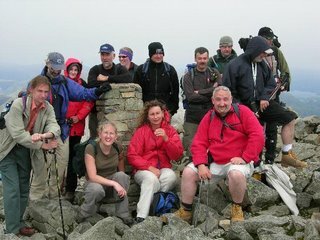 At 9am on Saturday 12th August 2006 a group of Geocachers including myself set off to reach the top of Scafell Pike. 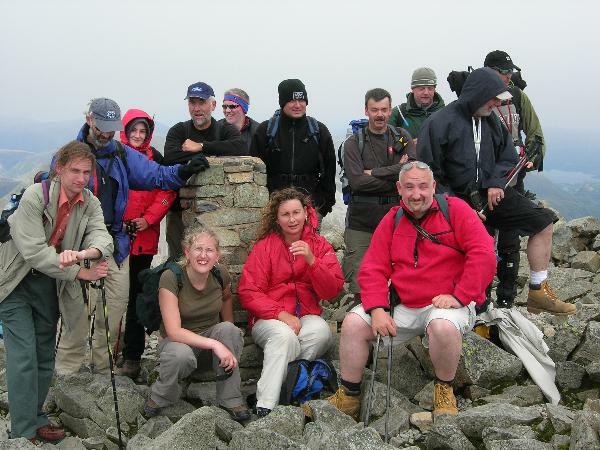 In short we all made it to the top, and we only lost a few going down ;-). You can read more about the adventure here. As unbelievable as it may sound Microsoft have released Windows Live Writer, a blog authoring tool that works not only with MSN Spaces (Microsoft’s bogging service from MSN) but with may others including Blogger, LiveJournal, TypePad, WordPress and more. This is my fist post using it, and although I am not wondering how I survived without it, I am finding it intuitive and it is not annoying me. If you want to have a play then a beta version can be downloaded from the Windows Live Writer blog. I am not really in to computer games, and that normally includes games on the Internet, but I was really impressed with Goggles. This is a fun flash based flight simulator that uses the satellite imagery from Google Maps. Last night I was watching the BBC’s Click Online programme that I recorded at the weekend. Half way through they played the Llama song, that I most enjoyed, and I am please to report that is can be found online here. A Christmas number on do you reckon? The office is in turmoil today after the realisation that the Bakers Oven may no longer be able to supply us with the Cornish pasties and ham and chicken sandwiches that we require to get through the day. We first herd about the closure on the BBC local news, but it was not until today that we realised that our favorite store may be converted to a Greggs store.